Displaying Ph.D.-powered pride are crimson-gowned Jin Cheng “George” Ye, Anouska Bhattacharyya, and Cammi Valdez. Ready to take on the world are Harvard Kennedy School class marshals Theodore Zagraniski (M.P.A. ), I-Chun Hsiao (M.P.P. ), and Jonathan Chang (M.P.A.). 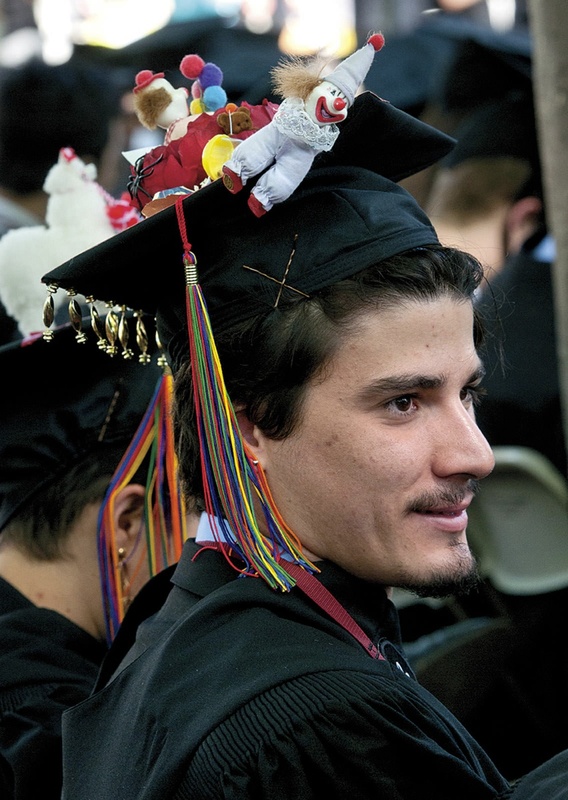 Francisco Andreu ’14 dolls up his mortarboard. 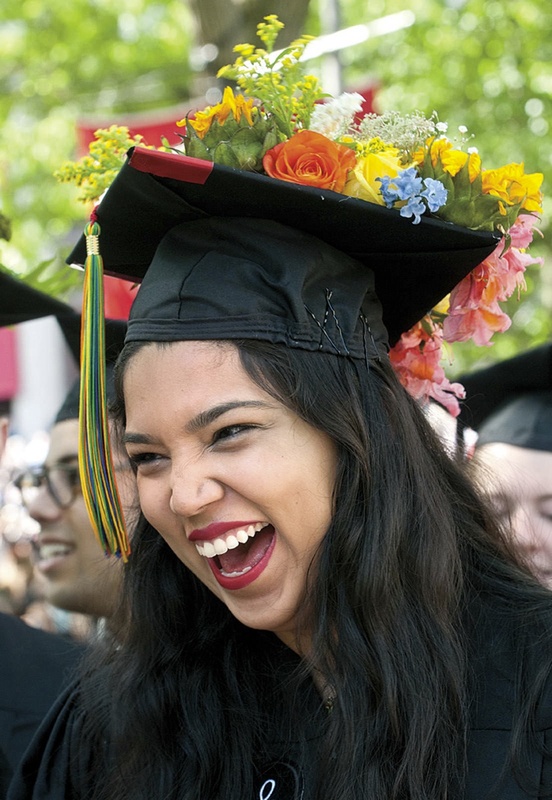 Pearl Bhatnagar ’14 blossoms with graduation spirit. 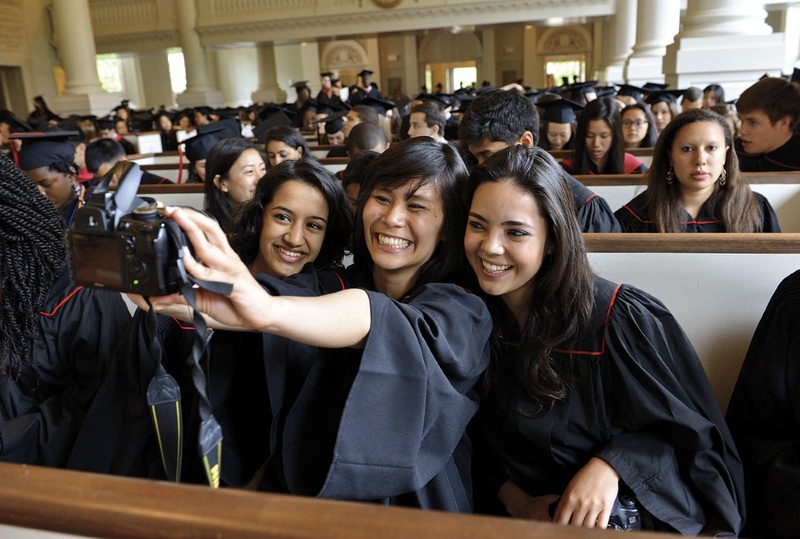 Memorial Church memories: a Baccalaureate-service selfie encompasses seniors Raina Gandhi, Jen Zhu, and Maria Barragan-Santana. Dunster House seniors Monica Nesselbush (holding pole), Victoria Wenger (middle), and Chloe Soukas (at left) show the flag. Second Lieutenant Taylor Evans ’14, already a veteran of five years in the Marine Corps, has his officer’s insignia pinned on by his family. Canine critic Zoë, the seeing-eye dog of Kristin Anne Fleischner, J.D. 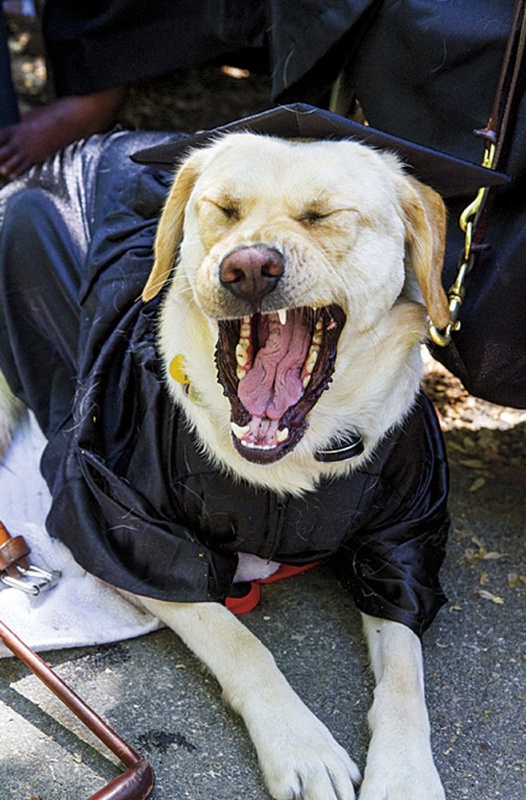 ’14, attends Commencement suitably attired. Honorand Aretha Franklin pulled a switcheroo, to a soulful national anthem. The late, cool spring was not the exact type of the long, cold winter, but it was a passably fair relic. Tuesday morning, the stellar seniors processed to the Phi Beta Kappa literary exercises under a shower of elm seeds from the Old Yard canopy, kept comfortable in their gowns by breezes and a temperature of 58 degrees—the day’s high. Wednesday dawned with showers of real rain drops, at 50 degrees and falling. 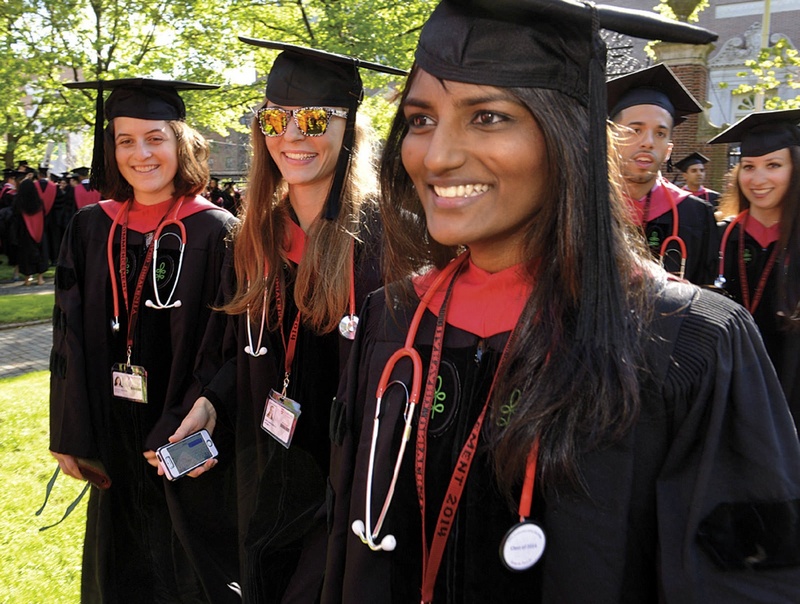 By Commencement morning, May 29, it was downright autumnal—44 degrees, nearly a record low—but with brilliant blue sky overhead: a tradeoff every Commencement official gladly made. Encountered en route toward the Yard at 6:35 a.m., University marshal Jackie O’Neill, who runs the Morning Exercises, said, “Just one day a year,” allowing a measure of grateful relief to mix with her usual calm. Thus set up, the show proceeded with brisk efficiency, less than usually interrupted (and enlivened) by protracted student cheering. Nonetheless, there were moments of spontaneity. 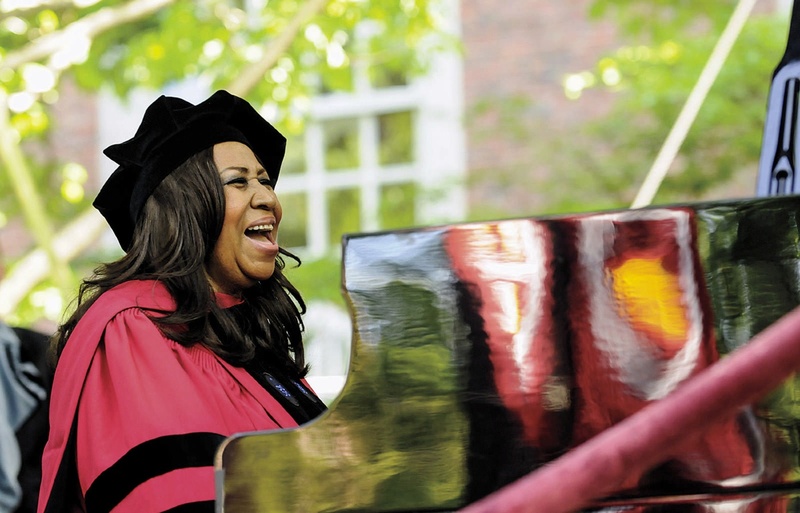 The Commencement program, as official a document as there is, specified that the “Soloist” would perform “My Country, ’Tis of Thee.” Once seated at the piano, honorand Aretha Franklin moved right into a soulful rendition of “The Star-Spangled Banner,” instead. When Faculty of Arts and Sciences dean Michael D. Smith spoke at center stage, beginning the presentation of student degrees, he doffed his cap, bowed, and followed the usual salutations (“Madam President, Fellows of Harvard College, Mister President and Members of the Board of Overseers”), but then, turning to honorand George H. W. Bush, added a simple, third element: “Mr. President.” Successive deans followed suit, until dean for medical education Jules L. Dienstag, presenting the M.D.s, included (for Michael R. Bloomberg, M.B.A. ’66, and Franklin), “Mr. Mayor and Madame Queen [of Soul].” When degrees were conferred on Franklin, Bloomberg, and Bush, the band played a few bars of “Respect,” “New York, New York,” and the “Bulldog, Bulldog” fight song, respectively: prearranged, but nice. 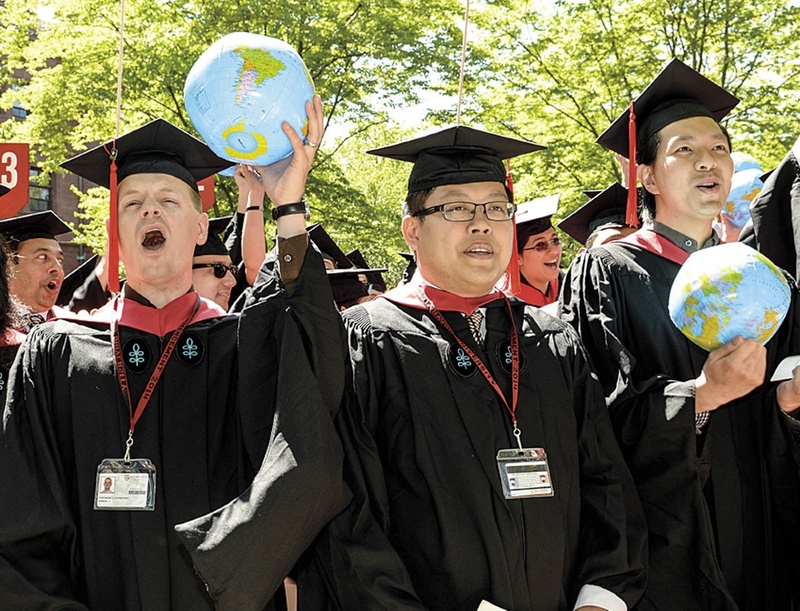 This was Harvard’s billion-dollar year, and Commencement. In September, the University unveiled its worst-kept secret of the millennium, to date: that The Harvard Campaign sought to raise $6.5 billion. The fundraisers did their work, and Harvard recorded its first billion-dollar gift year, and then some. Billionaire hedge-fund managers Kenneth C. Griffin ’89 and Bill Ackman ’88, M.B.A. ’92, made nine- and eight-figure gifts toward the Faculty of Arts and Sciences’ own $2.5-billion component of the campaign. Harvard Business School ($1 billion) dedicated Tata Hall, funded by a gift from billionaire Ratan Tata, AMP ’75, chair of India’s Tata Group. And Commencement itself featured representatives from that cohort, including the speaker at the afternoon exercises, former New York mayor Bloomberg (the desktop financial terminal/media billionaire), and the College’s Class Day orator Sheryl Sandberg ’91, M.B.A. ’95 (whose own first billion came via Facebook’s IPO). 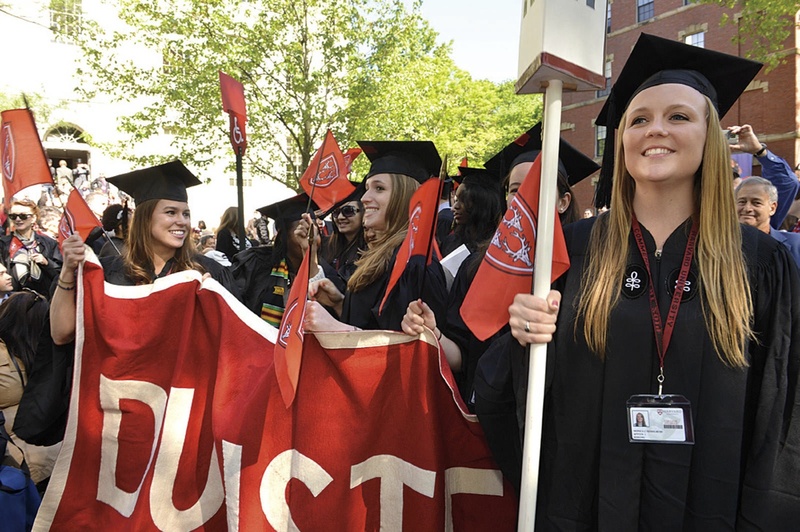 Amid these mind-numbing sums, it was not hard to fathom a finding in the Crimson’s senior survey: 31 percent of respondents entering the workforce have jobs in finance and consulting, and another 15 percent in technology and engineering. Ten years hence, those same seniors expect finance and consulting to exist only in their rear-view mirrors (just 6 percent in toto), with the academy, health, arts, government, and entrepreneurship looming much larger. Time will tell. For now, two very different students issued effective calls to service on Commencement morning. Senior English speaker Sarah Abushaar ’14 (a Leverett House resident born in the United States but raised in Kuwait City, an economics concentrator who has worked in several finance-industry positions) recalled being shushed by her parents as a child, lest her prattle in Syria cause trouble: “‘You’ll get taken by secret service if they hear you.’ The walls everywhere, we were told, could hear our revolutionary ideas and would send us to prison.” How different things are in Cambridge, she found. In place of an Arab spring, “[T]his graduation is sending 6,000 revolutions into the world in the 6,000 revolutions graduating as part of the class of 2014… if we take those waiting revolutions, those great ideas…out with us into the real world, into the real Tahrir Squares, and make something of them! Revolutions not in arms but in minds…more powerful and permanent…and pervasive. For, this isn’t a Ukrainian revolution or an Arab Spring, but a global revolution. Graduate English speaker Philip Harding, M.P.P. ’14 (headed for work on government innovation in Washington, D.C.), recalled George Washington coming to Harvard “uncertain of his future and his fate. He had received an offer he could not refuse: though he felt unworthy, he wrote to his family and said he felt ‘a kind of destiny’ was driving him to Cambridge…to take command of the…fledgling Continental Army”—the ultimate startup. Bows were made to the arts and humanities. With the renovated Art Museums nearing completion, their former director, Seymour Slive, was among the honorands. Emily Pulitzer, A.M. ’63, who provided vital support for that project, was awarded a Harvard Medal, as was Anand G. Mahindra ’77, M.B.A. ’81, who endowed the humanities center (see “Harvard Medalists”). The Graduate School of Arts and Sciences celebrated Keith Christiansen, Ph.D. ’77, chair of European paintings at the Metropolitan Museum of Art (see “Centennial Medalists”). The class of 1989 had classmate Alan Gilbert, music director of the New York Philharmonic, at the podium for its Boston Pops reunion concert. And although President Drew Faust began her afternoon talk by emphasizing scientific discovery (see “Talks, and a Text”), as she often has this year, the third leg of her argument focused on the search for meaning: the essence of humanistic inquiry. In a society that must sort out such issues—with the passion Harding prescribed, but with more open minds than Bloomberg discerned in Washington and elsewhere—perhaps the way forward was best represented by looking back to the service of the final honorand at this Commencement. Amid the day’s upside-down atmospherics, a different sort of reversal was staged. By conferring a degree on President Bush—Yale’s baseball captain, who took his team to the College World Series finals in 1947 and 1948—Harvard effectively mirrored Yale’s 1962 graduation. When John F. Kennedy ’40, LL.D. ’56, was honored in New Haven, he famously quipped, “It might be said now that I have the best of both worlds, a Harvard education and a Yale degree.” So for these two sports-minded presidents, one Crimson, one Blue, and their alma maters, the score is now a bipartisan 1-1. Perhaps fittingly, Harvard’s 363rd Commencement fell on President Kennedy’s birthday.